What's the purpose of itching? Come now, this isn’t that complicated. Itching alerts us to the presence of potentially troublesome critters and substances and impels us to poke at them. Notwithstanding occasional false alarms, surely you can see the value in acting reflexively to get rid of that bothersome tsetse fly or, more prosaically, some irritating tick, flea or louse. What’s less clear is how itching works. That’s a matter of more than academic interest, since as you suggest, excessive itching and scratching creates its own problems, and not having a clear idea what makes something start means it’s tougher to make it stop. When I first wrote about this subject years ago, it was thought itching was a mild form of pain. Nobody thinks that now. In 1997, a research team led by Martin Schmelz established the existence of itch-selective neurons called pruriceptors, a subset of the damage-sensing neurons called nociceptors. Pruriceptors specialize in detecting certain very faint stimuli and elicit a specialized response: Whereas pain makes you withdraw, itching makes you scratch. Looking at the larger picture, it also seems clear if you have a literally hair-trigger sensory modality, along with some legitimate signal you’re going to get a lot of noise. Itching is all in your head. OK, obvious up to a point—everyone knows the brain hosts all sensation. However, it helps to remember that when you sense an itch, what’s really happening is that a sensation we understand as “itching” is projected onto the map of the body maintained inside the brain. Itching can be controlled by pain. When we scratch, we inflict low-level pain on ourselves, which temporarily makes the itch go away. Although pain and itch are separate sensations, they use many of the same neural mechanisms and processing centers, and pain has the higher priority. To put it another way, when a neural pathway is carrying a pain signal, itch gets put on hold. Itching has many causes. A “bewilderingly wide range” of stimuli in the skin can trigger itching, Paus and company write. Histamine, the compound that triggers the inflammatory response, causes itching, but so do at least 15 other types of chemical stimuli, triggering various different sets of neural receptors. 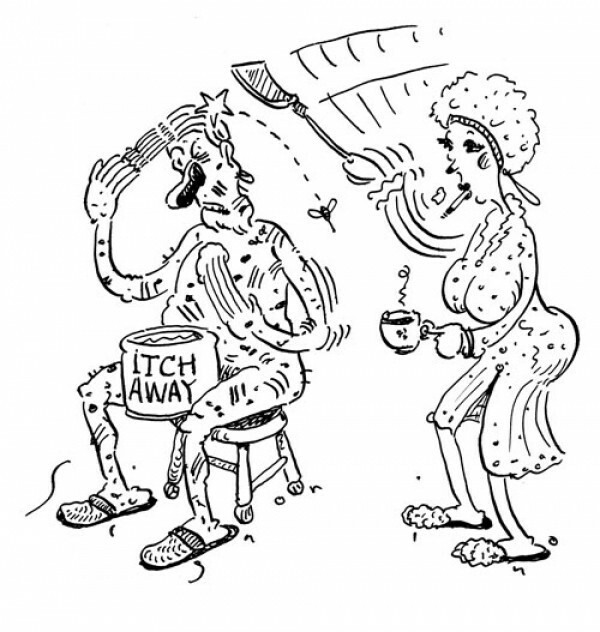 Itching, in other words, is merely a klaxon that calls attention to a broad array of irritants. It doesn’t tell you what the irritant is. Painkillers can make itching worse. You might think an analgesic would deaden all sensation and thus reduce itching, but in fact, often the opposite happens. This makes sense once you understand that pain tends to cancel itch out—when pain is out of the picture, itching is no longer held in check. The plus side of this is that pain in controlled amounts can make itch go away. For example, capsaicin, the painful irritant found in hot peppers, can be used to curb certain types of chronic itch. • Where most everyday itching is concerned, you’d better get used to it. Paus and associates make a couple points: First, nobody has found an itch control center in the brain that, if knocked out, would make itching stop, and there may not be one. Second, while the fact that itching can be suppressed by other sensations (in addition to pain, extreme heat and cold are also effective) opens the door to better treatments, the underlying mechanisms are extraordinarily varied and complicated and right now only dimly understood. For the time being, the most effective way of relieving itch is, alas, to scratch.